Translation in English, Spanish and Portuguese. San Anselmo, California designers Susan Lund and Kathleen Minahen Poer offer kitchen design and space planning with an emphasis on organization. Showroom, portfolio. Produces Merlot in San Anselmo. Includes information about the product, the company, and the history of winemaking in Marin County. Healing sessions, workshops and seminars in Cell Regeneration with Madalyn Suozzo. San Anselmo, California. Operates out of a residential garage, producing small lots of red wines in San Anselmo. Contains a company overview, newsletters, pictures, ordering information, and recipes. Family owned and operated center offers consultations, herbs, workshops. Includes articles on the Ayurvedic tradition and therapies. Located in San Anselmo, CA. Dr. Boyer Cole, physician practicing in San Anselmo, California. Hatha yoga classes for all levels. Workshops and retreats. Instructor biographies. Descendants of Louis Jordon Spivey, Samuel Thomas Clark, Anselmo Cocchi and Henry Dawson as compiled by Linda Joyce Dawson from Covington, GA USA. SiteBook San Anselmo City Portrait of San Anselmo in California. 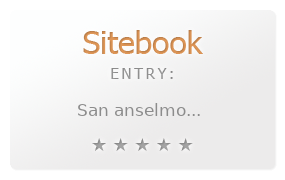 This Topic site San Anselmo got a rating of 4 SiteBook.org Points according to the views of this profile site.